The 6-in. 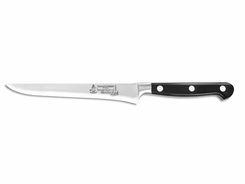 Flexible Boning Knife features the well-known standard shape of high-quality forged boning knives, with a flexible blade. As on every other forged elite Messermeister knife, you will find a 15° polished edge produced utilizing a detailed 3-step sharpening process.